Who remembers this ad? I certainly didn't until I came across it again in the pages of an old out-of-print issue of Dungeon. For some reason, no published adventure had me more stoked than Maure Castle in Dungeon #112 (in fact like a true fan-boy I own several copies). The collaboration of Robert Kuntz, Erik Mona and Paizo was certainly lightning in a bottle and they were lucky enough to follow up on the initial issue with two more levels in the later years (#124, #139). But look at the ad again, in my opinion no adventure path or seasonal event has more going for it in so few words. Those fans who followed Greyhawk for a long time must've been shocked and overjoyed to see Eli Tomorast, the main villain from the classic Kuntz module, Mordenkainen's Fantastic Adventure return from the dead for some payback. For me it was sort of like a Trekkie getting to see Ricardo Montalban in the Wrath of Khan for the first time. 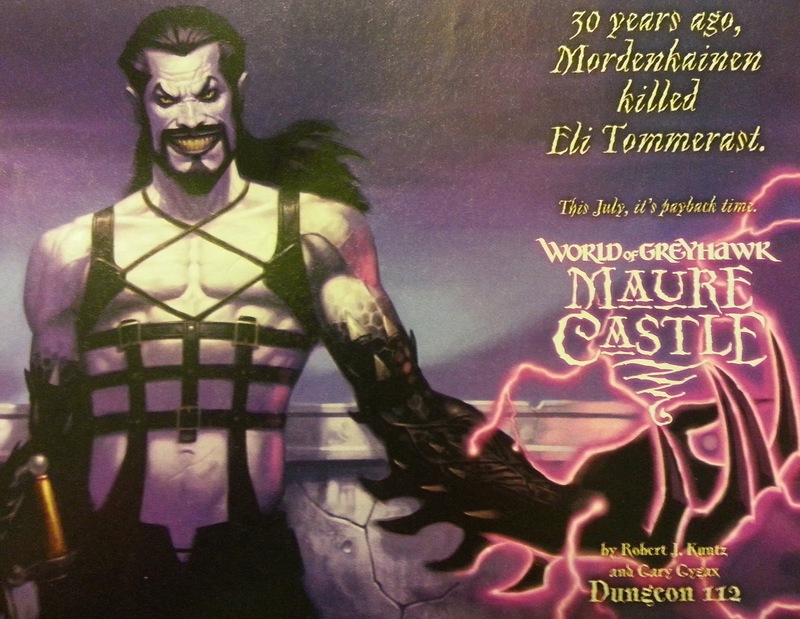 This ad had great art and a great title logo (with theWorld of Greyhawk masthead which you wouldn't see again), the only problem is they misspelled Eli's last name. Oh well, you can't have everything! Given that some years before, during the 2e era, I ran my players through the original "Mordenkainen's Fantastic Adventure," I was pretty excited to see Maure Castle in the pages of Dungeon for 3.5e. I had vague plans of running it, but I never got around to it. I really liked they filled in the "empty spaces" found in the original--and it seemed more difficult, comparatively speaking. Have you run either? What did your players think? Mine got angry at Gygax--not ME, the DM--for putting in such a terrible monster on the first level. A near TPK. (I was actually prepping them for the Tomb of Horrors--which they also got mad at Gygax for devising after another near TPK). I ran about 75% of it yes. My players enjoyed it as a dungeon crawl but HATED Eli so much because I loved using him. But then again that's what makes a villain great and memorable is the emotional reaction. And yeah, the threats at the first levels were brutal. It's the first dungeon I ever ran that seemed logical and realistic and not video gamey.